Hip pain can be a difficult diagnostic area because there are several potential causes of hip pain. Lumbar Spine- nerve pain from the back radiating to the hip region can present as predominantly hip pain. 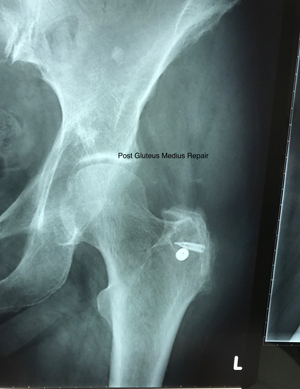 Sometimes it is the opposite problem where treatment is focussed on the back when in fact the source of the pain is the hip such as undiagnosed hip osteoarthritis. When a patient presents with hip pain then all these potential sources of pain have to be considered. With hip arthritis there will be stiffness in the hip on examination and X-ray changes. if the X-ray changes are minimal then an MRI may be necessary to show the cartilage damage. In Gluteal tendon tears there is demonstrated weakness of the hip abductors on examination which leads to pelvic instability and a limp. 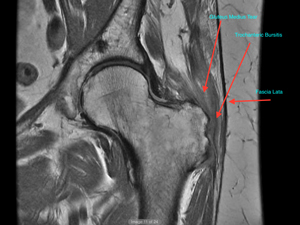 Complete diagnosis requires a hip MRI. In trochanteric bursitis there is tenderness over the lateral hip as well as pain with hip adduction which tightens the fascia and puts pressure on the inflamed bursa. When trochanteric bursitis is diagnosed the important distinction to make is whether there are gluteal tendon tears present or not because the tendon tears will have to be treated to resolve the bursitis. If there is trochanteric bursitis alone then there is non operative and operative treatment available. The preferred approach is non operative treatment and this consists of physiotherapy to improve muscle balance and flexibility. Also address any potential leg length discrepancy with a shoe raise or insert as this discrepancy causes pelvic tilting which can contribute to trochanteric bursitis. A steroid injection under image control can be helpful in reducing the symptoms. There is no role for repeated injections however and it should only be done in conjunction with a thorough physiotherapy programme. If a patient has persistent symptoms and has failed non operative management then arthroscopic fascioplasty can be performed. This is where the tight bands of the fascia are released and the bursa debrided arthroscopically. 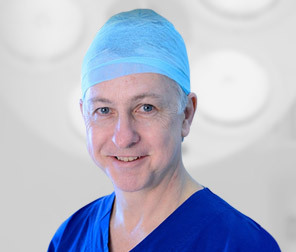 If Dr O’Carrigan feels this is necessary he would refer you to an appropriate hip arthroscopist. With symptomatic Gluteal Tendon Tears then there is a role for surgical repair. This is where the torn tendons are repaired back to the greater trochanter and this repair is reinforced with an artificial tendon called a LARS. By definition the tendon tissue is abnormal with relatively poor healing potential and the forces on the repair are large so the LARS is necessary to reinforce the repair and provide stability to the tendons - this is combined with a debridement of the trochanteric bursa and fascioplasty of the tensor fascia lata. With massive tears that have been present for a long period of time there can be secondary changes that occur in the muscle called Fatty Atrophy. This can be seen on MRI and if present then this can compromise the result because irreversible changes have occurred to the muscle that will result in permanent weakness. if extensive then this may preclude surgery being an option. After this surgery the patient is touch down weight bearing only for 6 weeks and the full recovery takes up to 12 months. Extensive physiotherapy is necessary to strengthen the hip muscles. Symptomatic Gluteal Tendon tears can lead to severe chronic hip pain and successful repair can provide dramatic improvements in pain and function.